Business mobile plans are notorious for their complexity and obscurity, so if you're a UK SME, how do you know if you're being ripped off? While regulator Ofcom monitors pricing across various sectors (eg, PDF), it doesn’t publish a detailed analysis of which is the most competitive – that's expensive and difficult – leaving the job to price comparison sites. That calls for statistical modelling, and Cambridge maths PhD Stelios Koundouros, CEO and founder of Billmonitor, called in Oxford Professor Chris Holmes to help. The model they built tried to make sense of real-world bills incurred by SMEs. The mobile tariff comparison service also used Freedom of Information (FoI) legislation to try to extract more information from Ofcom. From the work, Billmonitor estimated that 49 per cent of SMEs pay twice as much as they need to – a far greater proportion of the market than consumers (28 per cent). It said SMEs were spending around £3.3bn for their phone and data usage. An average SME could be saving around £10,000 a year, based on an overcharge of £399 per device, it said. The model suggests that larger SMEs fare worse. Larger enterprises also fare surprisingly badly, Billmonitor said, because big deals are negotiated. In September, Ofcom started clamping down on pricing bundles after being frustrated by the big MNOs, who failed to come up with a voluntary pricing framework transparent enough to please the regulator. (Ofcom said "mobile companies have not offered sufficient or firm commitments"). Billmonitor's Koundouros said he wants more action, though. "We call on the Competition and Markets Authority to investigate this failure of competition that Ofcom seems to show little interest in, as it successfully did for the energy market whose uncompetitiveness was in fact only half as costly for SMEs." BillMonitor's model indicated the cost difference between the highest and lowest tariffs is 16.3 per cent for the same usage patterns. After declining FoI requests for detailed information, Ofcom suggested earlier this year that the difference was 15 to 20 per cent, but more recently told Billmonitor the number was not reliable. "This is highly concerning to us and raises further suspicions of the regulator not doing its job to protect businesses from the lack of market transparency by mobile providers," Billmonitor said. The site explained the discrepancy because MNOs can hide high prices behind complexity. "A fair and efficient marketplace simply wouldn't see nine out of 10 SMEs overspending by 49 per cent on average, £1bn wasted annually, or indeed such surprising variation in cost between major providers," the report stated. Over 350 bills from the main three business MNOs – EE, Vodafone and O2 – were analysed, removing high usage outliers. 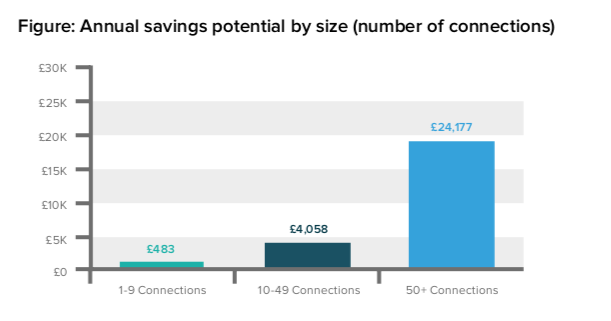 The model suggested EE was more expensive than Vodafone and O2; the fact that EE was 10 per cent more expensive was given an 81 per cent confidence, lower than the 95 per cent typically attributed to a model. We requested comment from EE.